I soon realised that there was another approach I had not tried. 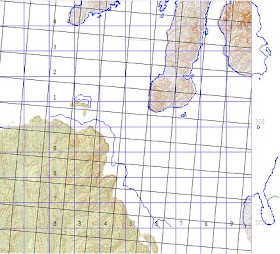 MapMate allows one to 'calibrate' a raster image by clicking on two locations and entering the grid co-ordinates. I have always found this a bit chancy and tedious to set up, and even then one is still often a pixel or two out. Even with this approach I was failing: I could get a raster map registered but it would be to the British not Irish Gird. Whilst doing this I finally remembered that MapMate will save a given map as a bitmap with an associated calibration file. This finally gave me proper insight as to how to crack the problem. were broken), and recorded all the values in a spreadsheet. Now using QGIS all I had to do was create a raster file with exactly the same bounds as the MapMate map. By setting the print option to 254 dpi I get as close as I can to 100 dots per cm which makes for easy computation of image sizes. I scaled maps to be 1:250k which is convenient both in terms of detail and effective for all vice counties. The largest dimension was around 5600 pixels, but most rasters were roughly 4000x4000. Once I'd tested out a quick draft of County Down, I then produced rather more considered maps of the 2 Donegal vice counties. These were made by using Overpass-Turbo queries to get specific features within a vice county and saving them as geojson files. Collins Progressive Atlas page 12 : my introduction to hill-shading, contours & hypsometric tints. I was about 6 years & 4 months of age. I also wanted to add hill shading and hypsometric tints. These help a bit in quickly identifying locations for data entry, but are of much greater value for someone looking at the distribution of a plant. Ultimately I may produce multiple versions suitable for different contexts: for instance the recently published Derbyshire Flora uses geology, or hypsometry as a background where this informs interpreting the distribution of a plant. Another motivation for doing this lies way back in my childhood. I was given a book at Christmas when I was six called Collins Progressive Atlas. 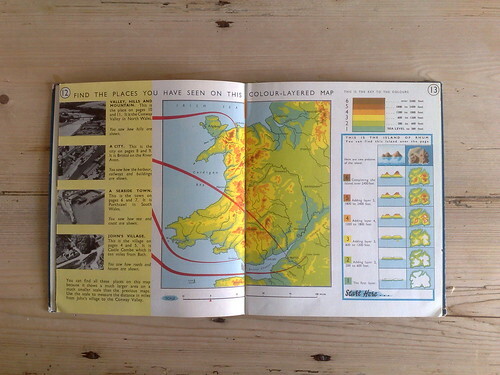 I still have it, and flipping through its pages I'm amazed at its ambition in teaching map reading & many of the principles of cartography to young children. The image above shows on a 2-page spread it introduces some rather sophisticated concepts. (An aside: I'd love a way to do something like the 3 opening page spreads for anywhere in the world. OSM is a perfect starting point). To do this I downloaded raster DEM files from ViewFinder Panormas, and processed them in QGIS to produce hill-shading, contours and tints. I did so pretty much using the standard defaults : these can be improved upon as can be seen from the work of folk like Andy Allan (Thunderforest) and Richard Fairhurst (cycle.travel). Having done this I worked through all 40 of the Vice Counties: the images are currently available on Flickr, but I have will eventually add added them on github along with the relevant calibration files. Thes should be usable directly in MapMate if all three files with the same base name are copied to the same directory. The last thing I wanted to do was understand MapMate's internal co-ordinate system. 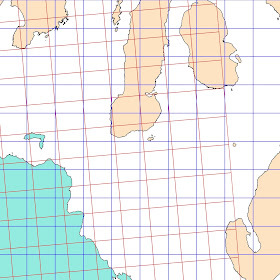 To do this I created two geolocated images which were 100 km square (basically the Irish Grid Square C and the British Grid Square composed of half each of NW & NR I made sure I had both grids visualised in the images. I then created MapInfo calibration files based either on bottom-left (corresponding to Irish Grid) or top-right co-ordinates (assumed British Grid). 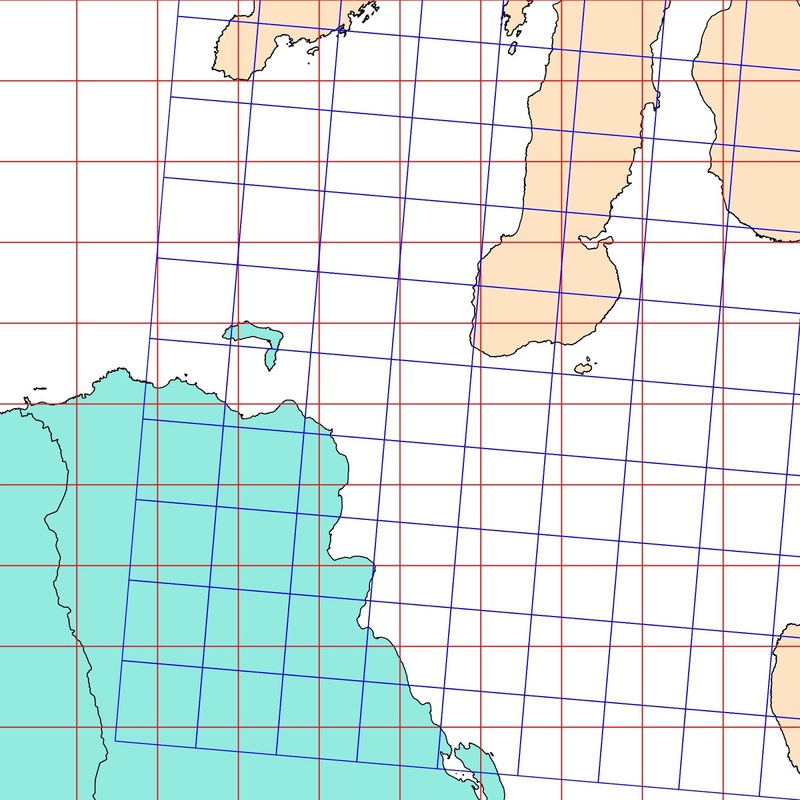 Using QGIS I created raster images with both Irish (grey-brown) and British (blue) grids. 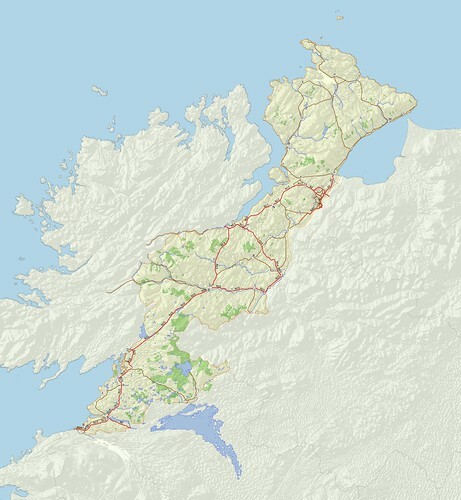 I then loaded them into MapMate, and overlayed these with the coastline data which comes with MapMate. 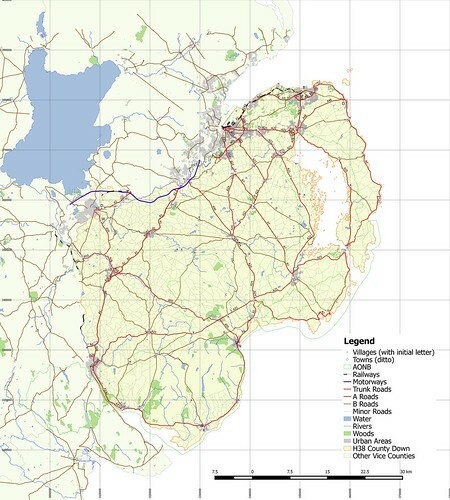 100km Irish Grid sqaure C. British Gird in blue. As was already clear, MapMate uses a kludge. 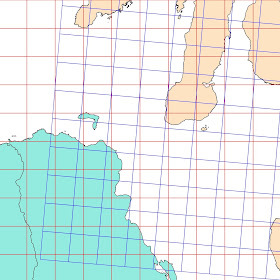 Irish Grid co-ordinates are mapped internally onto squares of the British Grid. It should be possible to work out which 10km squares belong to which grid system along the boundary (at least I assume the border is aligned on 10km grid lines). MapMate internally uses an Access database without any geospatial features. It also only allows its notional recording units to be grid squares (AFAIK, of any size from 1m to 10km), which helps because most geospatial calculations can be done using simple arithmetic. It does recognise that any particular grid square is within one of its internal polygons (local authority & vice county boundaries). As it does this quickly there may be a bit more to the code than just sums. The decision to rely on the useful properties of a regular kilometric grid, and effectively hard-wiring two grids into the code, has an unfortunate consequence for MapMate. It is not a practical tool for biological recording outside the British Isles (although I think at one stage it was adapted for Luxembourg). 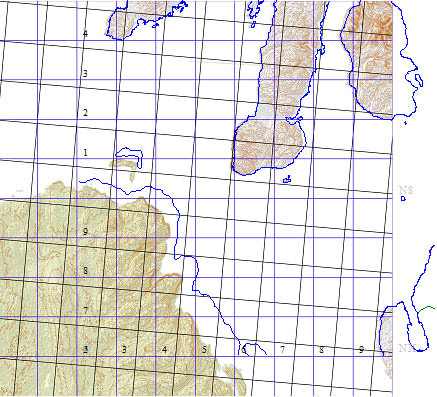 Whilst the Dutch & Swiss use 10km grids for recording, most other countries with well-established recording systems use some variant of a latlon grid: in Germany sheetlines of 1:25k maps are used in Baden-Württemberg, elsewhere it's often a 7.5 or 15 minute 'square'. (MapMate also suffers from being based on old technology, but that is another (huge set of) issue(s)). MapMate is still a phenomenally useful piece of software, widely appreciated by its users as being straightforward to use, but it increasingly suffers from both being based on very old software, and a business model which does not provide enough recompense for continued development. At the same time the newer approaches of web-based and app based data entry do not yet deliver all the same functionality. I've tried address one deficiency of MapMate with more accurate maps delivered as images. However it cannot fix how MapMate internally validates records based on boundaries. I do believe that this and similar approaches can be used to maintain or extend MapMate's utility until newer software reaches a similar level of functionality.